This amazing Pumpkin Pie you all. Just 7 Ingredients in the filling and 8 main ingredients in the crust. Make this a day before and keep refrigerated. No Baking needed. 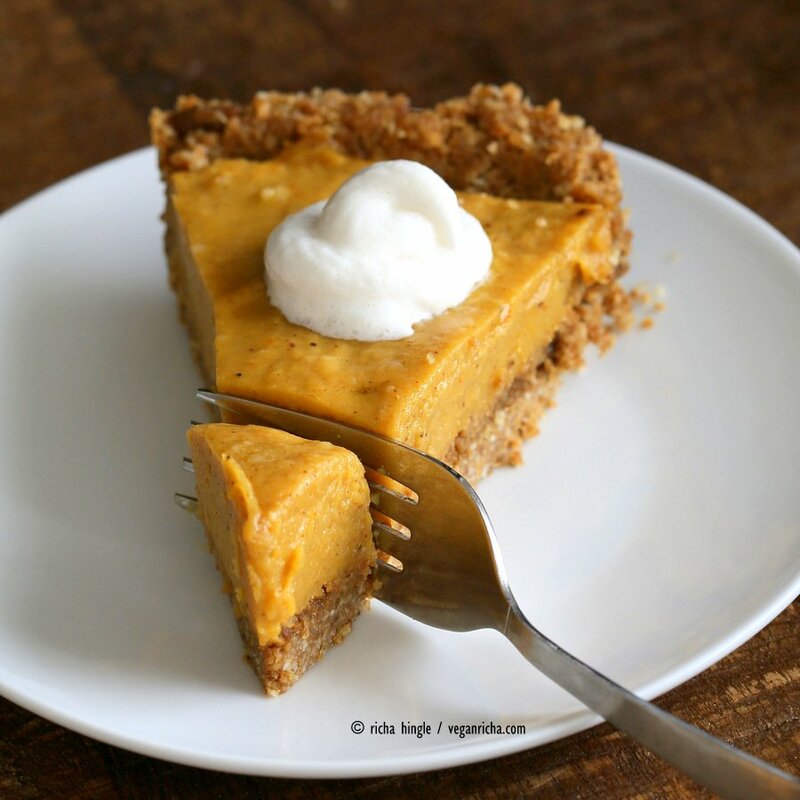 This Pumpkin pie has a good lot of spices in the filling and even more in the gingerbread crust. Crystallized ginger, ground ginger, cinnamon and cloves and yum! The filling is Cashew Free! Be sure to top with some whipped coconut cream! The chickpea flour makes the filling more custard like set and smooth. 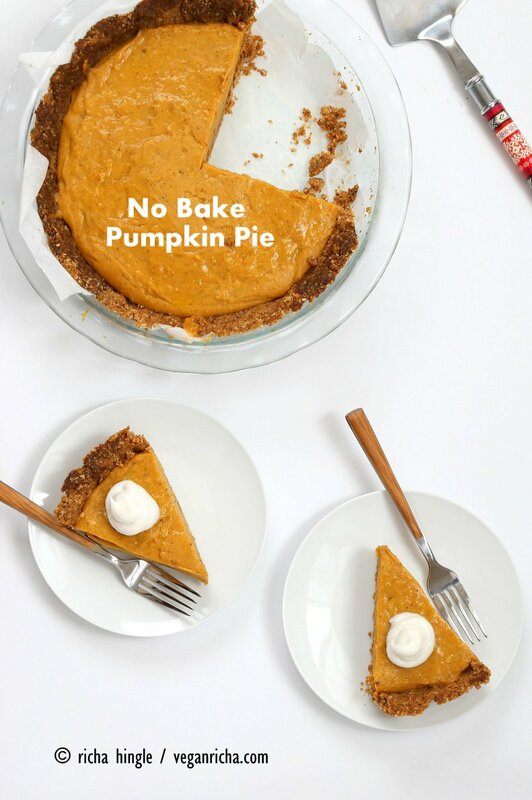 You can use just starches, use more pumpkin puree, use other crusts. 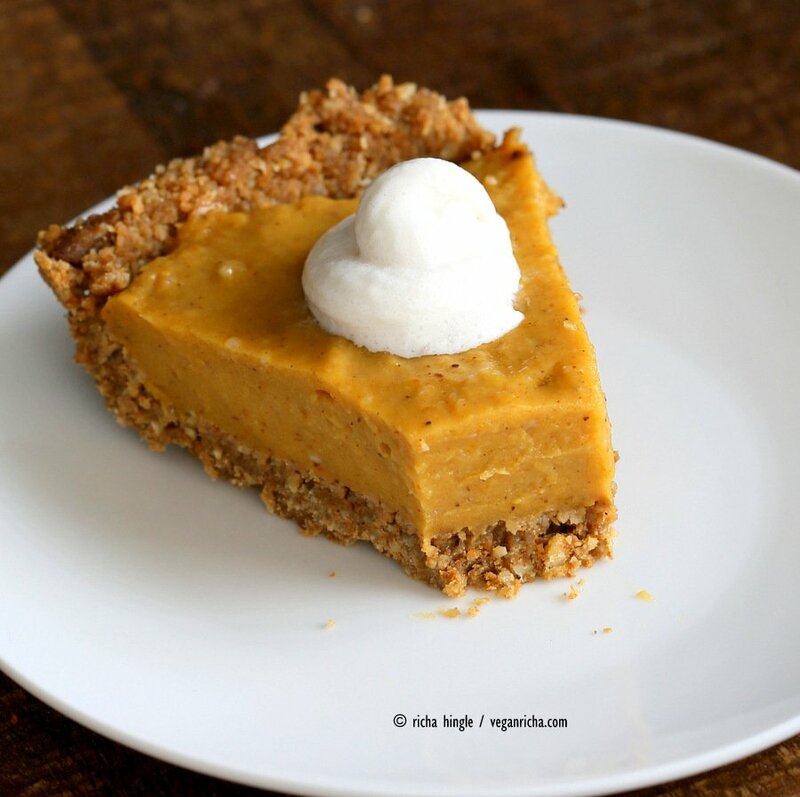 This No Bake Vegan Pumpkin Pie will be a perfect addition to the Thanksgiving Menu! If you guys make any recipe from the blog, please do tag it on Instagram with #veganricha! I love to see how the recipes are working out and love the pictures! 3 Tbsp starch like arrowroot or cornstarch tapioca doesnt work as well. reduce starch by 1/2 tbsp for less gelatinousness. Pulse the coconut with crystallized ginger in a blender, to break down the ginger and the coconut flakes to smaller flakes. Pulse a few times and transfer to a bowl. Add the rest of the flours, coconut sugar, spices. salt and mix well. Add oil, molasses and maple syrup and mix well. it will take half a minute for the mixture to start looking wet. Get your hands in there to warm up the molasses and mix well. Add a few tsp non dairy milk if needed to make a crumbly dough. Fill the pie pan with the dough and shape into a crust by pressing with your hands inside out. Mix coconut milk and sugar, starch , chickpea flour in a pan at medium heat. Keep whisking so the sugar and starch dissolves well. Once the sugar has dissolved, add in the pumpkin puree, spices, oil and mix well. Keep stirring with a spatula and bring to somewhat boil. The mixture will keep thickening and some large bubbles will try to escape. 5 to 6 minutes total. Continue to stir and cook for another minute or 2. the mixture will visibly thicken and start to leave the pan at some places. You should be able to feel the stiffness in the mixture. Taste carefully and add sugar if needed. Mix in the vanilla and take off heat. Let it cool for a minute then pour into the prepared crust. Even it out using a spatula. Let cool for 10 minutes, then refrigerate for a few hours to overnight. Top with whipped coconut cream and serve. Perfect timing! My oven stopped working last week so this is just what I needed. Thank you! Awesome! Let me know when you make it! Why do you suggest using regular sugar for the crust? Would coconut sugar not do the job or any other healthier option of “sugar”? I used coconut sugar in the crust. and used raw unrefined sugar in the filling. . You can use coconut sugar for both. Ok so, this looks positively amazing and I was really excited to give it a try but I have an insane allergy to coconut! Do you know of any variations to the mylk, and other coconut ingredients in this? …or would it mess with the texture and basic composition of it all? you can use any other non dairy milk. it should work out fine. the texture should work out the same with creamy milks like almond or soy, and will be slightly less creamy with hemp or rice milk. in the crust, just use more oat flour and almond meal instead of coconut. pulse the crystallized ginger with oat flour to break them down. Thank you for giving options . It’s terrible when we suffer from allergies but we still want to make delicious recipes. 🙂 Thank you!!! Would rice milk work for the filling? I know it won’t have as much fat/creaminess. 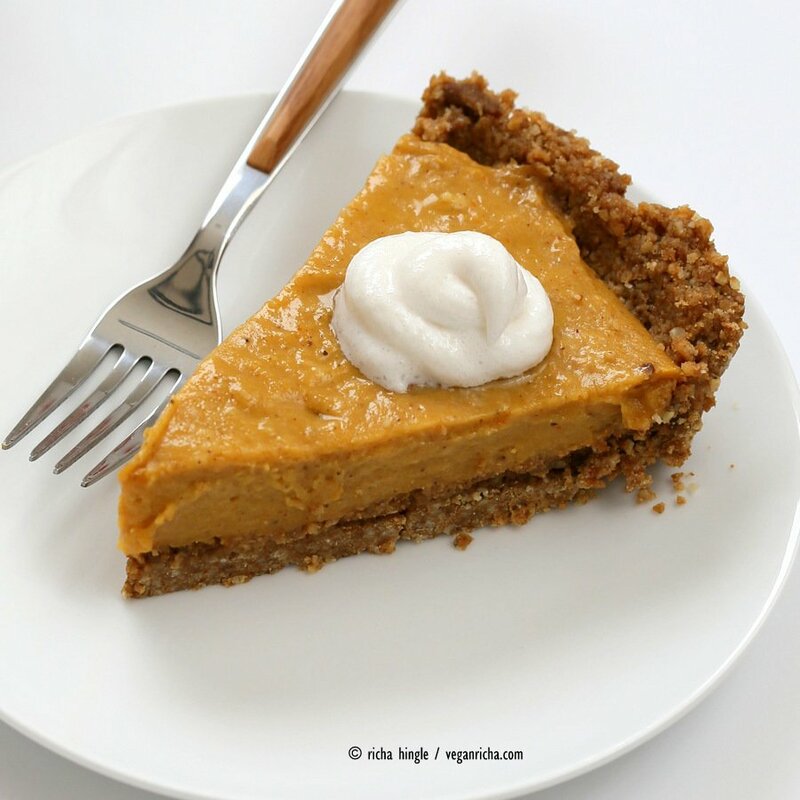 I have family members who are allergic to nuts, coconut, and soy and a really really want to find a pumpkin pie recipe we can all eat! Thanks! Yes it will work fine with rice milk. You may want to add another 1/2 Tbsp of chickpea flour/other flour to add volume and act as thickener. in the crust, you can use finely ground seeds instead of the almonds and coconut. Awesome, thanks so my for replying! Wow! I would never have thought to use chickpea flour in the filling. You are, as ever, a genius Richa! hi! Just cking, crust is no bake too, not just filling? Would it hurt @ all to bake it a little while before pouring in filling? Just thinking about crust texture… Thanks! the crust also is no bake. you can taste the crust mixture to decide if you like it as is or not. if not, then bake it at 325 degrees F for 10 to 15 minutes. if you are not sure, then make the crust into truffles 🙂 and use a different baked pie crust. See my chocolate pumpkin tart or strawberry tart for baked crusts. The flavor was great, but my pie didn’t set. I think I followed all the instructions. Any ideas? 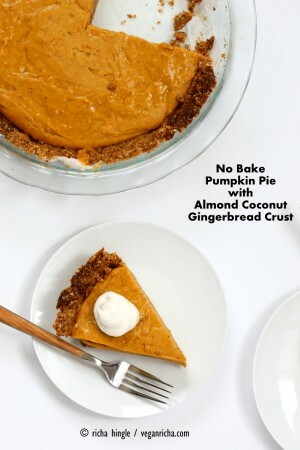 That crust is soo good with the pumpkin filling!! Hi! Love your recipes!!! We have a nut allergy, can I just sub extra flour for the almond meal? sure, use more flour or use a different plain pie crust. Can I substitute raw honey &/or maybe a little stevia for the sugar? (We just do not use sugar). use stevia. liquid sweetener will change the consistency. can i use almond meal instead of chickpea flour for the filling? almond meal will not dissolve into the filling and make it gritty. You can use other flour or use ground cashew. Looks amazing. Bc of nut allergy I am going to use a vegan traditional crust. I am going to need to bake it because of this. Should I still cook on stove top first? Or am I better off baking crust alone and then adding the filling as you instructed? Bake the crust until done, then fill it with the filling that has been cooked and thickened on stove top as the recipe says. even it out and chill. I havent tried baking the filling. it might need adjustment in thickeners so it sets during baking. it sets perfectly when cooked on the stove top and chilled. Hi! My mom has gone full vegan on me, and I’m hosting Thanksgiving. I have accepted the challenge and am looking forward to trying new recipes. However! The bonus challenge is that she has also eliminated oils from her diet. Any thoughts on how I can replace the oil in this recipe? I haven’t done enough cooking with a lot of these ingredients to feel comfortable experimenting on my own. Hi Mary, you can omit the oil from the filling. It has enough fat from the coconut milk to be super creamy. For the crust, use more maple syrup or some smooth nut butter instead of oil. Also try the pie before the main event, so you know what adjustments you might need in terms of flvor and texture. yes more cornstarch + potato starch. Is it molasses and maple syrup or we pick which one we want to put? no, it needs both to make the crust. There isnt any other wet in the crust. You may add some non dairy milk and reduce either of molasses or maple just a bit. Sorry maybe stupid question how to make pumpkin puree? Blending a raw pumpkin meat? its available canned. It is cooked pumpkin. you can bake it at home. Preheat oven to 325 degrees F .Cut the pumpkin in half, Remove seeds and pulp. Cover each half with foil. Bake foil side up, 1 hour, or until tender. Scrape pumpkin meat from shell halves and puree in a blender. Richa sweetie, We should not be eating raw bean flour or starches. These contain large protein molecules that are undigestible without proper soaking and cooking and will contribute to development of leaky gut over time. Please, do some careful research on this issue before health consequences arise. please search for Dr Alessio Fasano on YouTube and watch his presentations. Much Love to you. If you actually read the instructions, you will see that the besan is cooked on the stove. I haven’t made your recipe yet but im wondering why you seem to think it is a good thing that the filling is cashew free? Nothing good or bad about cashews. I mention it because people have cashew allergies. Many pie recipes use cashews to thicken, so I mention that this recipe is cashew free. Could Kuzu root work as the starch? Hello! what can I use instead of almond meal. Allergies…. and molasses can I sub in something else. Use 1 tbsp maple syrup. you can use more flour to sub the almond meal, start with a 1/2 cup more and add more as needed depending on the dough consistency. oh no. Usually a pie pan works fine if lightly greased. the lining definitely makes it easier as the crust moisture can vary from person to person, so less chances of sticking. Let me add some notes to the recipe. I am sorry about that. You can put this pie into an ice cream maker which is just finishing cashew cream + vanilla+sweetner, so there will be swirls of the pumpkin filling and the crust for a pumpkin pie ice cream. will look prettier maybe :). Or just serve the pie pieces with a big dollop of fluffy whipped coconut cream to cover it. Wow! 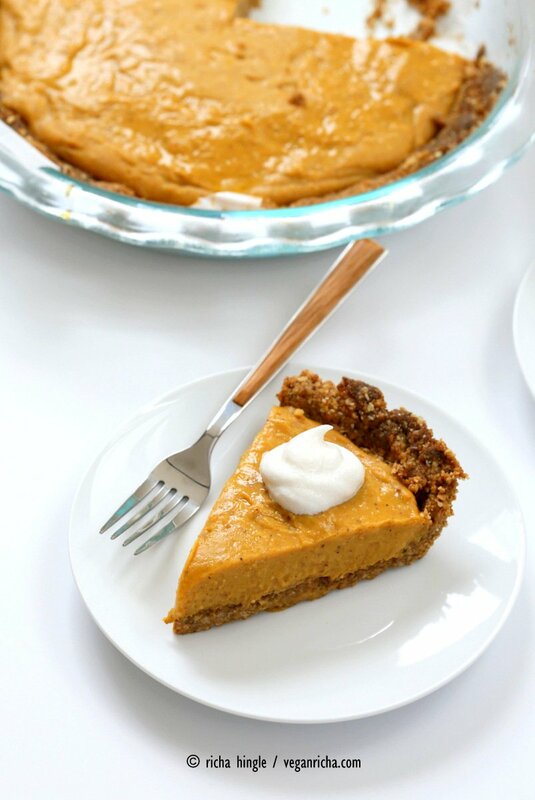 I served this pie as a GF and vegan alternative to the traditional pies I also made for Thanksgiving dinner. I should have made two pies because everyone(all carnivores except my husband and me) skeptically tried it. Loved it, and came back for seconds(ok I admit i had thirds) and asked for the recipe. We even had family stop by our house the next night that asked if there was any of the “vegan pie” left so they could have a piece. You are a genius! This goes on the Thanksgiving table next year. Thank you for working so hard to bring us delicious recipes that help change the health of our families and create memorable family meals. haha, thats amazing, that everyone was skeptical and then got multiple helpings! yay!! So glad everyone loved it.